Yellowknife is built on permafrost, but there is nothing cold about the welcome awaiting visitors who come to enjoy log buildings, luxury hotels, caribou steaks, caviar, and dog sled teams. 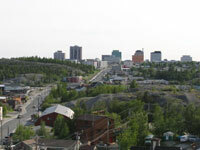 This small but thriving city is the gateway used by those planning to explore other points in the Northwest Territories and the adjacent territory of Nunavut. It serves as the kick off point for a variety of extreme adventure tours and unique vacations in the heart of the northern wilderness. The city is on the north shore of Great Slave Lake and offers its own attractions, like boating, fishing, hiking, birdwatching, canoeing, and walking tours. A popular attraction is the quaint Old Town section with its views, historic buildings, and the Wildcat Cafe where local and visiting musicians entertain with jam sessions. In winter (September to April), the sky remains dark most of the day and the spectacular Northern Lights (Aurora Borealis) appear. A good vantage point to view them is from the top of the Bush Pilot's Monument in Old Town, six storeys high with a 360 degree view. Located within what is known as the Aurora Oval, Yellowknife is one of the three best places in the world to view the Northern Lights. Fairbanks in Alaska and Lapland in Norway are the other two. Located just 30 minutes from downtown Yellowknife, Aurora Village is fast becoming a major tourist attraction and offers visitors from all over the world a rare opportunity to see the luminous lightshow in a geographically perfect setting. Consisting largely of tepees (heated for your comfort), Aurora Village is a traditional-feeling, suitably ambient place to spend a cold winter's evening, spellbound by the incredible, colourful patterns that grace the night sky overhead.